And so I reverse-engineered it’s schematic! And because ultrasonic transducer had metal coating on top of the ceramic plate(which is pretty usual stuff), the wire vibrated off taking away big piece of that metal coating. The ultrasonic cleaner is dead. R.I.P. But wait! It’s corpse can serve us in a way other than cleaning stuff.. So I’ve decided to reverse engineer this thing. Someone might need this schematic, and it would be a pretty good learning material for beginners. The other board that is not shown here is a Timer Board, which is just seven segment display, some no-name MCU, three buttons and LED. It connects to the main board with three-pin connector(GND, +5V and ON/OFF 5V signal from MCU). And just counts down time switching off the cleaner when the time is up. 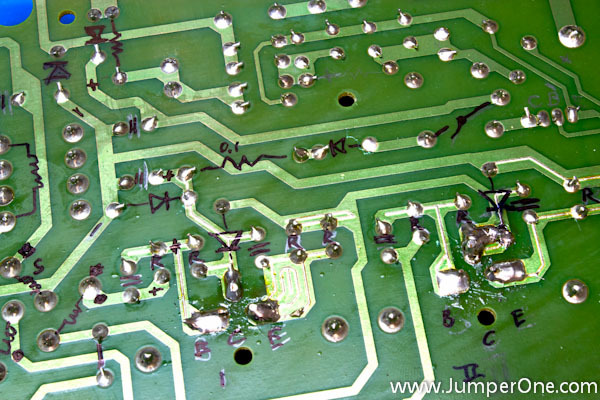 When reverse engineering board with through-hole components, it might be very helpful to draw schematic symbols on the back. This approach might considerably speed things up. And after you’ve done, just wipe off those drawings using some alcohol and brush. 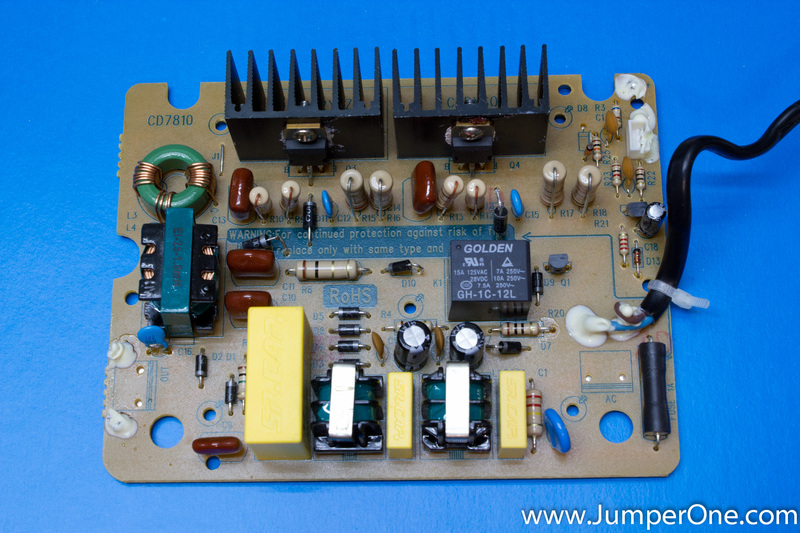 Only those two transistor solder joints were really crappy, otherwise it has a good quality soldering joints. 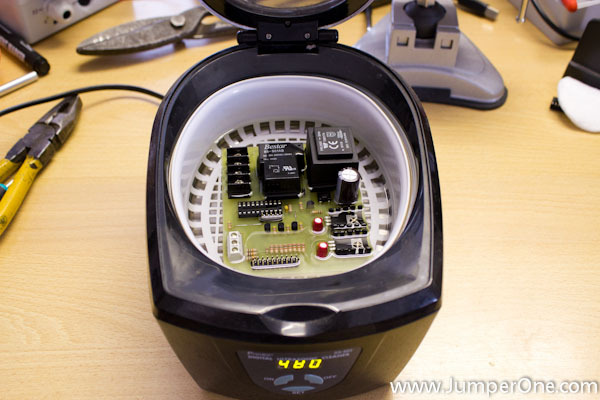 Here is reverse engineered schematic of this ultrasonic cleaner. This model is very popular and manufactured under many brands. But originally it’s CODYSON CD-7810. You can see how filtering is done, to prevent high-frequency stuff going back to mains. You’ll find nice example of how to drive half-bridge driver through transformer. 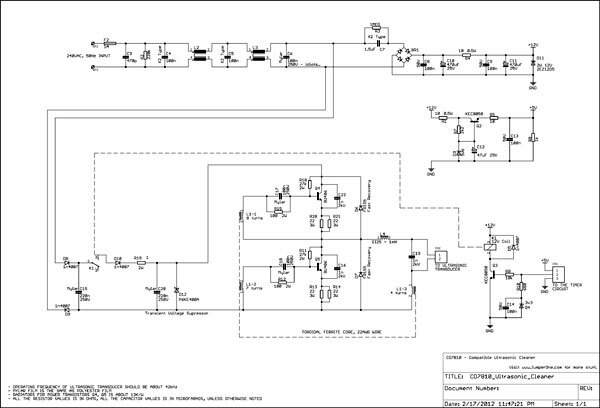 How not to make a mess in a schematic drawing? Maybe..